Home to Cornell and Ithaca College in the central Finger Lakes Region of New York State, Tompkins County and Ithaca exemplify a small-town atmosphere, while showcasing the qualities of a larger metropolitan city. The Finger Lakes Region is made up of 14 counties that occupy 9,000 square miles of the state. Tompkins County measures 476 square miles. Ithaca sits at the southern tip of Cayuga Lake, the longest of the 11 Finger Lakes. By car it is just four hours from New York City, one hour from Syracuse, two hours from Rochester, and four hours from Philadelphia, PA. Specialized shopping and restaurants provide a unique and exciting variety for all tastes and ages. The state parks and many lakes offer the best in fishing, hunting, swimming and boating. Local wineries, art galleries and museums provide something for everyone – which is why so many people return to Ithaca year after year. ONCE YOU LEAVE THE CITY OF ITHACA you quickly come upon rural landscapes, friendly and quaint villages and hamlets and some magnificent State and Federal forest areas. It’s possible to get up from behind your desk and find yourself pedaling a mountain bike down a single-track trail, cross-country skiing the backcountry, and hiking along a cascading waterfall, paddling a kayak downstream or tacking your sailboat upwind on Cayuga Lake in less than 30 minutes. 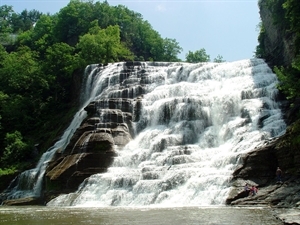 State Parks have plenty to offer Tompkins County residents and tourists. Whether it’s exploring the shapes of sedimentary rock exposed within the gorges or launching a kayak in one of many streams and rivers, the choices are many and varied, but all are memorable. If you love scenic beauty and outdoor activities, then Tompkins County is the place for you! For more information on these parks and others in the area please visit www.nysparks.state.ny.us. Tompkins County is full of unique recreational opportunities and is proud to offer a vast variety of programs to youth through the Tompkins County Recreation Partnership. The Recreation Partnership was created 18 years ago to make the affordable activities, sport leagues and special events offered through the Ithaca Youth Bureau available to kids living in municipalities outside of the City of Ithaca. No additional fees are charged for residents living in participating municipalities. For full information and a list of participating members, please go to www.tcrecpartnership.com or call the Ithaca Youth Bureau at 607-273-8364. Ithaca’s Historic State Theatre, a classic 1,600-seat movie palace, is host to over 60 events each year, including concerts, theatricalproductions, Broadway tours, dance performances, lectures, readings, and community events. In 2011-2012 a performance byGaelic Storm and the Cowboy Junkies was featured; and shows such Bobby McFerrin and Ithaca Ballet’s “Swan Lake” are offered. Guster has played at the State Theater, as well as Lisa Lampanelli, the Count Basie Orchestra and the Ailey II Dance Company. Visit www.stateofithaca.com. For live stage theater, The Kitchen Theatre opened in a new space for its 20th season in September 2010 and offers a ‘Bold, Intimate and Engaging’ experience in its new 99-seat theatre. Go to www.kitchentheatre.org. The Hangar Theatre also made a debut in 2010 of its refurbished space – go to www.hangartheatre.org for more information. For live music, the Finger Lakes GrassRoots Festival of Music and Dance is an annual event held the second-to-last weekend of July in Trumansburg, New York, a lovely small town ten miles north of Ithaca. GrassRoots draws nearly 20,000 visitors throughout the course of four days and presents over 70 musicians, bands and dance troupes on four simultaneously-running stages continually throughout the long weekend. All proceeds generated go towards charities supporting arts, education, and the fight against AIDS. The festival has been named one of USA Today’s top 10 outdoor music festivals. Genres represented among the musicians include bluegrass, Cajun, Zydeco, African, reggae, country, Americana, Native American music, old-time music, Irish music, jam band, rock and roll, hip hop, Conjunto, rockabilly and more. For information about the 2014 event, check out www.grassrootsfest.org. The Discovery Trail awaits young and old alike offering eight museums and exhibiting organizations – start at the Museum of the Earth, step over to the Cayuga Nature Center then on to the Cornell Laboratory of Ornithology, the Johnson Museum of Art, the Sciencenter, The Cornell Plantations, the History Center of Tompkins County and then put your feet up at a downtown landmark, the Tompkins County Public Library. Recovered? Get on the Cayuga Wine Trail, circle the lake on the Cayuga Lake Scenic Byway and throw in the Greater Ithaca Art Trail for good measure. And speaking of libraries, The Friends of the Tompkins County Public Library hold two book sales each year; one in the spring and another in the fall. The number of items available for each sale usually exceeds 250,000. The selection is amazing, and the prices are jaw-dropping. Bring tons of shopping bags to carry your goodies home, and patience to brave the long lines and general chaos. And don’t forget, if you’re not a big reader, don’t fret – the sale also features a modest selection of cassettes, CDs, and vinyl. That should do it for starters. TOMPKINS COUNTY IS LOCATED IN THE CENTRAL FINGER LAKES REGION of New York State about 250 miles to the northwest of New York City. The nearest larger cities, Binghamton and Syracuse, are an hour’s drive by car, while Rochester is roughly a two-hour drive. The city of Ithaca is at the convergence of many regional two-lane state highways: Routes 13, 13A, 34, 79, 89, 96, 96B, and 366. The Route 81 interstate highway is just half an hour away. 100 years. Today, the Medical Center is a 204-bed, acute-care, highly accredited, state-of-the-art regional medical facility committed to providing the highest quality healthcare and a strong economy in partnership with the community. CMC has 1,225 employees and has over 200 credentialed physicians on its medical staff. In its role as the region’s primary health-care facility, Cayuga Medical Center (www.cayugamed.org) remains committed to investing in Tompkins County and to increasing the breadth of local healthcare services. In the past year, the Medical Center honored this commitment with continued progress on its five-year physical plant renovation, expansion of services, and purchase of new equipment. In 2010, The Cayuga Heart Institute at CMC ushered in a higher level of cardiac care when it began performing interventional cardiology in Ithaca. In addition, a new cardiology department opened that year. In 2012 Cayuga Medical Center opened a new state-of-the-art laboratory and began renovating 33,600 square feet and constructing a 4,400 square foot addition for the Department of Surgery. The Medical Center continued the expansion of its Imaging Services Department, which has been ranked by the Business Journal of Central New York as one of the most comprehensive providers of imaging services in the region, offering all of the modalities found in major medical centers. Jan 13.9 F° 22.6 F° 31.2 F° 2.1 "
Feb 13.7 F° 23.4 F° 33.2 F° 2.1 "
Mar 22.4 F° 32.4 F° 42.3 F° 2.6 "
Apr 33.1 F° 43.8 F° 54.5 F° 3.3 "
May 43.4 F° 55.4 F° 67.3 F° 3.2 "
Jun 53.1 F° 64.4 F° 75.7 F° 3.9 "
Jul 57.2 F° 68.7 F° 80.1 F° 3.5 "
Aug 55.9 F° 67.3 F° 78.7 F° 3.4 "
Sep 47.9 F° 59.4 F° 70.9 F° 3.8 "
Oct 37.3 F° 48.4 F° 59.4 F° 3.2 "
Nov 30.6 F° 38.9 F° 47.2 F° 3.1 "
Dec 20.3 F° 28.2 F° 36.1 F° 2.5 "
Tompkins County experiences a moderate climate, with cold, snowy winters and sometimes hot and humid summers. The valley flatland has slightly milder weather in winter, and occasionally Ithacans experience simultaneous snow on the hills and rain in the valley. The natural vegetation of the area, seen in undeveloped and unfarmed areas, is northern temperate broadleaf forest, dominated by deciduous trees. Due to the microclimates created by the impact of the lakes, the region experiences a short but adequate growing season for winemaking, and as such is the gateway to the many fine wineries of the Cayuga Wine Trail. Home care Senior center Visiting nurses WITH SO MANY CHOICES FOR RECREATION, EDUCATION AND ENTERTAINMENT, Tompkins County is attractive to people of all ages, lifestyles and backgrounds. And older adults have an abundance of services from which to choose in this thriving community. For active retirees, there are miles of hiking trails through the beautiful Finger Lakes Region as well as many golf courses, and opportunities for swimming and boating. Winter welcomes snowshoes, skis and ice skates. Lifelong (www.tclifelong.org), a local senior center, offers numerous learning opportunities ranging from computer classes to opera appreciation, and local history to painting lessons. Excellent health care services are located at world-class facilities in Tompkins County. GADABOUT Transportation Services provides door-to-door rides to doctors’ appointments and shopping for seniors over 60. Several independent senior housing and assisted living facilities, rehabilitation services and nursing homes provide specialized care to the elderly of the community. The Tompkins County Office for the Aging works with a variety of governmental agencies and non-profit organizations to ensure availability of a wide range of services and programs for seniors of all ages and interests. For additional information on senior services and programs, visit www.tompkins-co.org or call 607-274-5482.